The Nashville Megabus stop has moved again. As of March 27, 2013 it is now at 704 4th Avenue South. Megabus announced the Nashville bus stop change via Twitter. Stops change rapidly so always check the bus line website before traveling. Twitter is also proving to be a good way to stay abreast of the changes. We have just found out that the Megabus stop has been moved and is no longer at the Commerce Street location. The information on the bus stop at us.Megabus.com reads: "All services to and from Nashville arrive and depart from Nolensville Pike between Windgrove Street and Moore Avenue. This stop is located near the entrance to the Tennessee State Fairgrounds. Our old stop at Commerce Street is no longer in use." The above information was updated and is current as of 2/18/2013. Inforrmation can and will change without notice as the bus line updates its stops. Always check the Megabus website for the most current information. As always, if you are a rider and have something to add to this or any of our blog posts please let me know. The comment section is always available or you can email me directly. All of the Megabus services to and from Nashville arrive and depart from the primary Megabus stop. It's located on Commerce Street in Nashville between 5th Ave N and 4th Ave N. This is the only stop for the Knoxville and Memphis routes. Megabus riders going from Nashville to Louisville, Indianapolis, Chicago, Chattanooga or Atlanta will depart from the alternate stop at the Ramada Limited at the Stadium Downtown. The hotel address is 303 Interstate Drive in Nashville, 37213. Look for Megabus on the right side of the hotel. Please note that this Megabus departs 15 minutes earlier than the stop on Commerce Street. Look for the Megabus stop in front of the hotel. Drivers don't have to worry about where to park. Tripadvisor has more information. Update: On the date of this blog post, we were originally told that parking is $20 per day at the Ramada Limited at the Stadium Downtown . Hotel staff today informed us this morning that parking is only $5 during the week or $10 on weekends, you can leave your car at the hotel for the duration of your trip. This is per the hotel front desk clerk as of the date of this article. She said the stop on the right of the hotel is easy to see and 'you can't miss it'. If you arrive hungry, don't worry. We found out that a Shoney's restaurant is only a five minute walk from the hotel. The staffperson informed us that German and Japanese restaurants are within walking distance and that she felt more comfortable during the daytime than at night. While you're at the Ramada Limited be sure to peek at the guitar shaped swimming pool. It's world famous. A photo of it is sure to be a conversation starter when you get home. 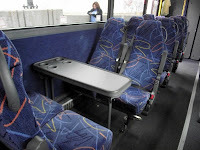 Read more on Weighing in on Megabus from Nashville. Post updated on 3/10/12 11:53 a.m. to reflect new information as mentioned above.